"Approximating the power released by a six-pack of hydrogen bombs... Andrews was searingly, exhaustingly astonishing." 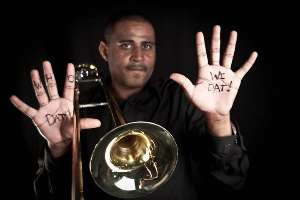 In a city whose spirit world is as old as Mother Africa’s children, Glen David Andrews, a native son of New Orleans, has made a compelling case for his own deliverance with a powerful new project that correlates his own reclaimed life to his reclaimed city. Andrews comes from a storied extended family of musicians. He was born in the historic Tremé neighborhood – which many consider to be the oldest black community in the United States – where the struggle to survive is older than the mighty oak trees in the Crescent City. According to family folklore, Anthony “Tuba Fats” Lacen, a patriarch of modern New Orleans music, directed the bell of his horn toward Andrews's mother's belly as a way to induce labor. Andrews was born the following day. Transfixed by the magic and mystery of the city's second-line parades, Andrews and his older brother, Derrick Tabb of the Rebirth Brass Band, along with their younger cousin Troy “Trombone Shorty,” soaked up life's musical lessons by learning the history of the brass band tradition firsthand from iconic figures like Tuba Fats. They also learned the power of the city's Mardi Gras Indian culture. Starting on the bass drum as a child, Andrews soon picked up the trombone; he was blowing a joyful noise by the time he was 12. He practiced his musicianship and showmanship with the city's most energetic brass bands, from New Birth and L’il Rascals to ReBirth and Treme. "He's always had a massive presence and a massive sweetness,” says Paul Sanchez, the New Orleans singer-songwriter who has collaborated with Andrews. That presence and sweetness have long endeared Andrews to audiences at his regular gigs at such New Orleans clubs as dba and Three Muses. In recent years he began making waves as a headliner at the world's biggest block party – the annual New Orleans Jazz & Heritage Festival where he has ripped it up in the gospel tent, the blues tent and the jazz tent. “ “Glen is one of the giant talents of New Orleans music,” says the festival's producer Quint Davis. With the release of Redemption, Louisiana Red Hot Records is also making available four of Andrews's previous projects: the gospel-driven Walking Through Heaven’s Gate (recorded live in 2009 at Zion Hill Baptist Church in New Orleans where Andrews was baptized); Live at Three Muses, a sweaty club date from 2012; and two trad jazz releases, French Quarter Jazz from Jackson Square (his first recording, from 1997) and Dumaine Street Blues (2002). 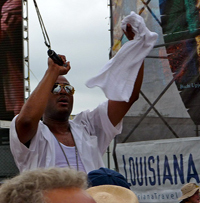 Writing in the Wall Street Journal last year, journalist Blumenfeld offered: “Onstage and off, electrifying club audiences and street scenes, speaking his mind at civic rallies, Glen David Andrews perhaps best embodies what David Simon, creator of the HBO series Treme, meant when he said, "culture is what brought New Orleans back."